An idea to harvest a few pieces of wood from a family barn turned into an epic project to salvage the entire structure and use it in the author’s new home. The old 1949 barn in Mississippi had seen better days. A few years earlier, a tornado scored a direct hit and tore a gaping hole in the roof. The rainwater that followed ate large holes in the floorboards, and the structure was listing badly. It was a sad end to the family barn that had brought so much joy to my wife over the decades. A hayloft is a wonderful clubhouse for any kid, and time spent playing among the creaky rafters filled her childhood memories. We were about to begin construction on a new home in the mountains near Leavenworth, so the idea of salvaging a piece of wood or two from the old barn delighted her. Perhaps we could make a fireplace mantle or bedroom door, and we could tell our son about the barn his great-grandfather built by hand. Our family no longer owned the land and the current owner had no interest in repairing the barn. His plan was to let it slowly rot, so we hoped he wouldn’t mind if we commandeered some wood for the new house. But I couldn’t shake the image of all that gorgeous 100-year-old wood just going to waste. Surely it deserved a more fitting end. That kernel of an idea eventually grew into an epic family adventure. 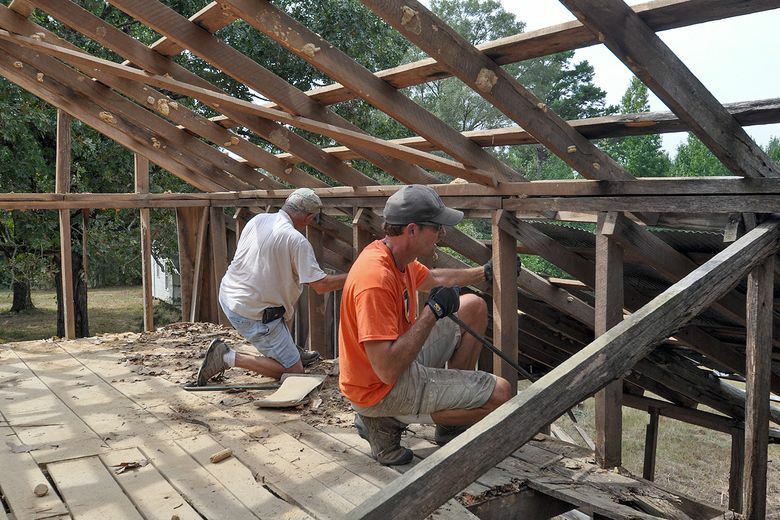 A few months later we would find ourselves sweating in the intense Mississippi heat as we used crowbars and hammers to salvage the entire structure, board by board. An idea to harvest a few pieces of wood from a family barn turned into a project to salvage the entire structure and use it in the author’s new home. 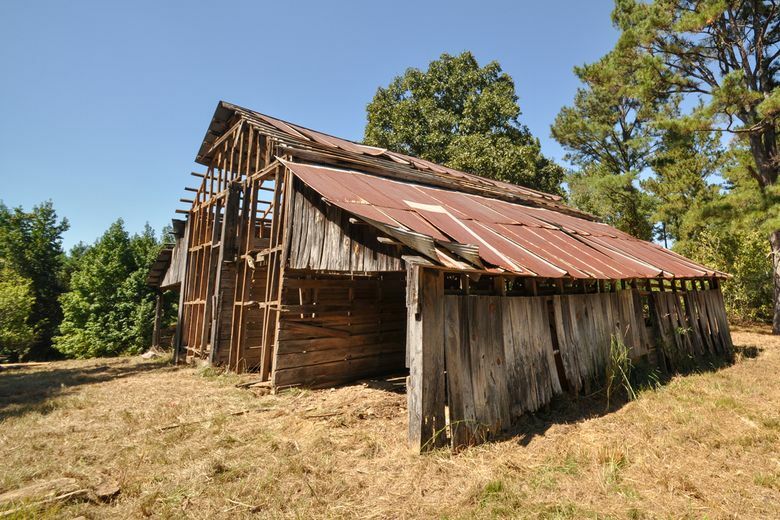 Across the United States, old barns are disappearing from the landscape. Consolidation in the farming industry means that small family barns aren’t as useful as they once were. They’re expensive to maintain, and the structures built generations ago don’t fit the needs of modern farmers with their huge machinery. Drive through rural communities and you’ll see remnants of old barns everywhere. Sagging roofs and fallen walls are reminders that, not long ago, the family barn was commonplace. So what if you don’t have a barn? If you don’t have a family barn there are other ways to obtain antique wood. Your best bet is word of mouth or approaching landowners with derelict barns and offering to dismantle them. Don’t underestimate the effort involved — it will take hundreds, if not thousands, of hours over several weeks. Another method is to search online for small-scale contractors around the country who specialize in reclaimed wood. Structures such as barns and warehouses in the Northwest are primarily made from fir, while those on the East Coast are often made from hardwoods. 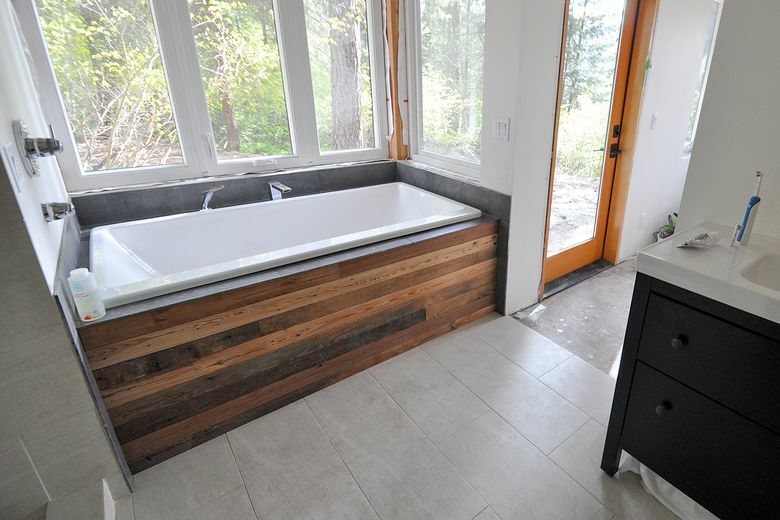 Salvaging weathered wood before it’s gone forever and using it in new construction is a trend known as upcycling. The reclaimed wood adds a feeling of history to homogenized, mass-produced buildings that’s difficult to replicate. The landowner agreed with my father-in-law that we’d be doing him a favor if we tore down the barn. 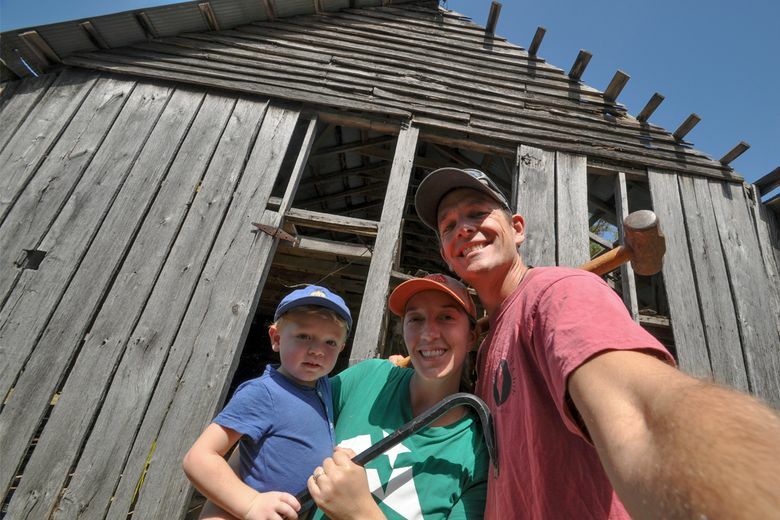 It would be a sentimental project for our family, and the owner wouldn’t have to worry about safety concerns when the barn eventually fell over. To my surprise, almost everything was made of oak. Not just the floorboards, but everything from the rafters to the feed troughs was hardwood. Back in the day, a farmer would hire a mobile sawmill to cut up whatever timber was standing on the property. For decades, that wood was exposed to the baking sun and soaking humidity of the Deep South, aging it with a patina that’s impossible to manufacture. As we started stripping off pieces, it struck me that the building was a woodworker’s gold mine. I began to imagine how big sheets of the rusty corrugated roofing could become siding on the new house. The gray exterior pieces would become amazing headboards. But our big goal was to salvage enough wood to fill our new house with antique flooring. The more we removed, the more excited I became. But the site didn’t have any power, and without heavy machinery, demolition had to be done using hand tools. Pulling down old walls was dusty work, and we kept a lookout for fire ants, mud wasps and snakes. Removing old nails was tedious. Just a single piece of metal left in the wood would ruin the blade on a sawmill (costing you several hundred dollars), and it was easy to spend hours digging out rusty bits from just a single beam. 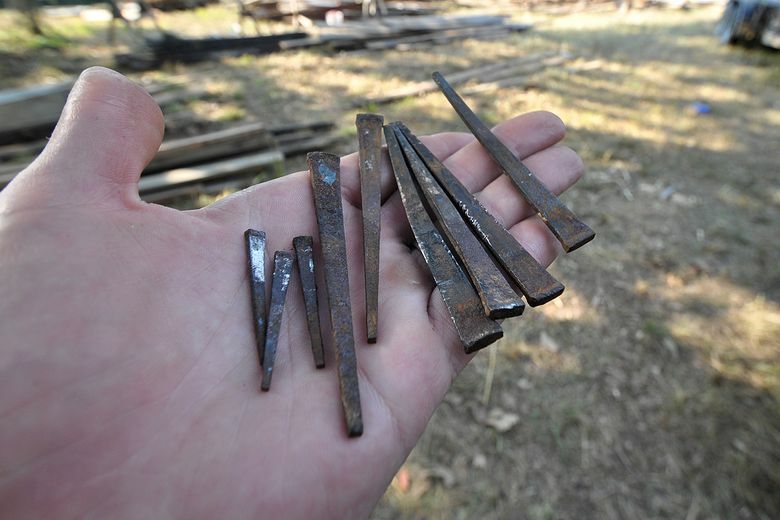 In some of the wood we found treasure within treasure: old bullets, as well as square nails, indicating they were hand-forged more than a century before. We recruited extended family to help us, and together we formed an assembly line with some of us tearing down rafters and others digging out thousands of nails (only five screws were used in the entire building), then scanning and rescanning the wood with our metal detector until it was clean. Once we had a large stack of wood free of metal, we hired a neighbor to drive our haul to a local sawmill. We chose to cut everything into standard three-quarter-inch tongue-and-groove flooring. To maximize the wood, we got seven widths, with the largest beams becoming 10-inch-wide boards. Two months and $6,000 later, our wood was milled and we trucked it across the country, along with the metal roofing and some random pieces that we didn’t have time to clean before milling. We didn’t want to introduce any foreign insects into our new house, so we bought a garden sprayer and treated the wood with Bora-Care to kill any bugs that survived the milling. At last, it was time for the real fun to begin. Using varied board widths and a variety of hardwood species brought some risk. We weren’t sure how our new floor would expand and contract. 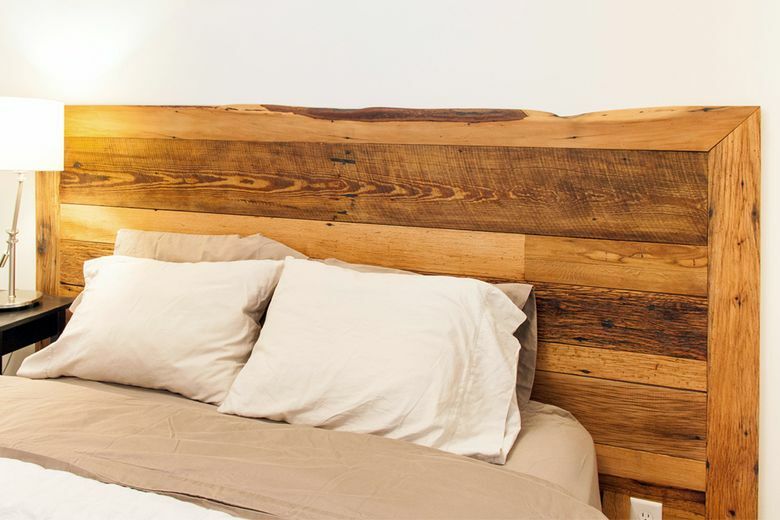 But a nice aspect to using reclaimed wood is that your imperfections become camouflaged among the thousands of knots and old nail holes. 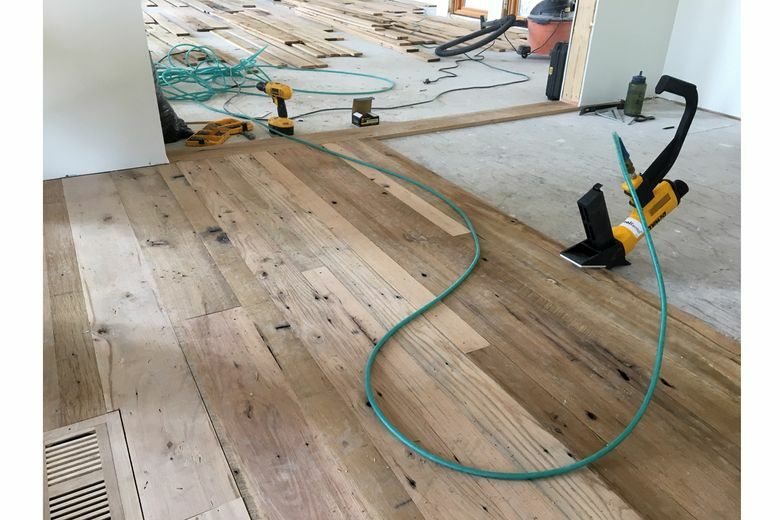 Like assembling a puzzle, we selected the pieces with the most character, trimmed off the bad spots and started laying out our new floor, mixing and matching hardwoods that looked attractive together. Once the flooring was tacked down using a pneumatic floor nailer, we filled the holes using Timbermate, which resembles a black paste. It’s hard to bring yourself to smear black goo all over your newly installed floors, but when you drum-sand the wood to even it out, the holes transform into flat spots that simply look like old knots. Finally, we used a hardening wood oil called Rubio Monocoat that we applied with a floor buffer, and a day later our new floors glowed with a lovely golden hue. Since finishing the floors, the huge pile of remaining barn wood has gradually been transformed into countless creative projects. The old wood is simply a joy to work with. No two pieces are the same. Benches, beds, kitchen islands, bathtub surrounds and shelves tie the house together and continue to remind us of that old barn. Would I do it again? Absolutely. It was exhausting work and I’ve probably lifted each piece of wood at least 50 times during the process. The total cost, from plane flights to transportation to milling, far exceeded the cost of buying new oak. But there’s no way to replicate its character or history. Back in Mississippi, the only thing remaining is a hole in the ground where the barn once stood. There’s some sadness to that fact. But every day we look around and see reminders of that history. And there’s no price you can put on that. Writer Jeff Layton owns Osprey Acres near Leavenworth. 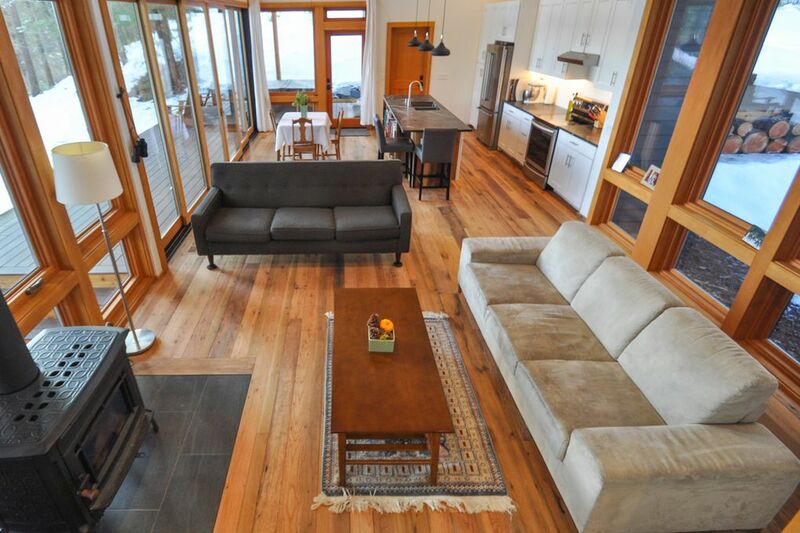 You can experience the finished project firsthand by renting the home via Airbnb.com or Peerspace.com.